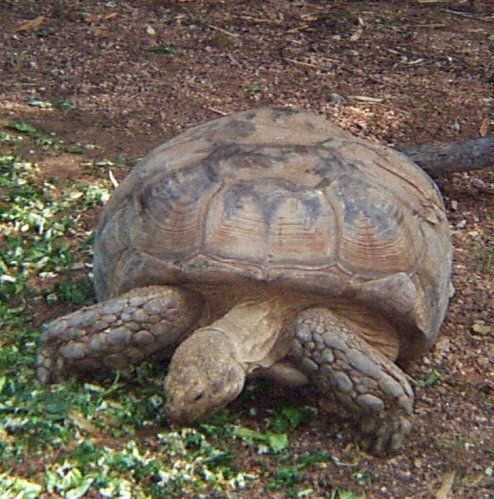 The African Spurred Tortoise is the 3rd largest tortoise in the world! 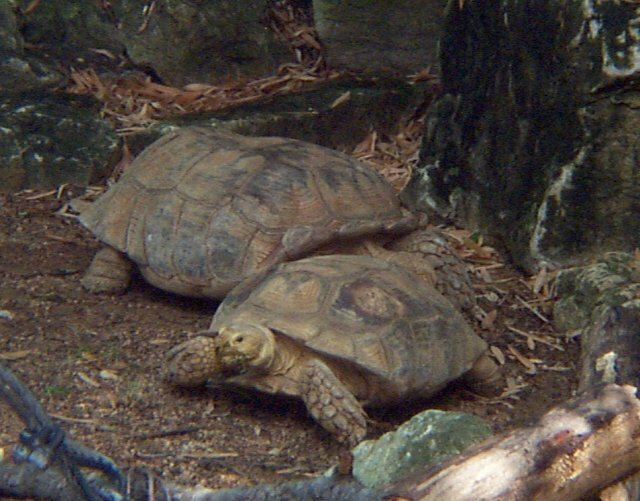 The much larger male and the female sulcata begin the mating process in the rainy season. The males are very vocal in this process. The female sulcata digs a pear shaped hole to bury her eggs in. The baby sulcata are a pale yellow and brown color with a two inch, wavy textured shell. After about 8 months, the babies hatch, usually during a rainy season, and begin their dig toward land. The sulcata is the only tortoise in the world that is fully adapted for terrestrial life. As a defense mechanism against predators, the sulcata will retract its body under its hard horny shell to where the only thing showing is the front surface of its forelegs, which is covered by scales, and the soles of its hind feet. To protect itself from an even bigger predator, the temperature, sulcata is famous for digging burrows. Sulcata can go weeks without food or water, but when they do get ahold of some water, they can drink up to 15% of their body weight. Sneaky little critters, like oppossum and raccoons, tend to sneak up on sulcatas when they are sleeping. Common house pets like cats and dogs can be very harmful to a sulcata just by playing with it. They can even be deadly to them if they decide to use sulcata as a chew toy. 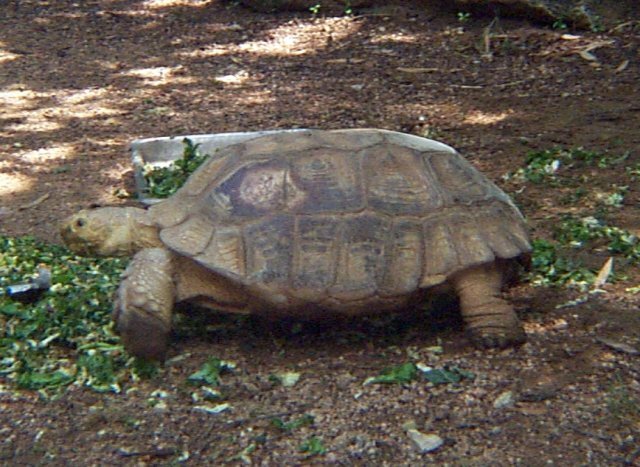 On March 21, 2000, the USDA, United States Department of Agriculture, prohibited the importation of many African land tortoises, including sulcata. And because this tortoise is common in the U.S. pet trade, the USDA also prohibited interstate trade of African land tortoises. Exotic ticks, know to bare heartwater disease, were being found on these tortoises. The USDA agreed that when protocols and treatments have been established, the rule would be lifted. To see if this rule is still in effect go to http://www.aphis.usda.gov/ppd/rad/webrepor.html. The Fort Worth Zoo G. sulcata are a breeding group composed of a male and a female from Africa. On average, the female sulcata lays 15-20 eggs in one sitting, usually in the months of December through March. At the Fort Worth Zoo, 27 eggs have been recorded to have been laid during one sitting. Between 1995-1997, the Fort Worth Zoo has had 54 hacthlings under their care. The Spurred Tortoises at the Fort Worth Zoo spent most of their time hanging out on the grassy patch. When they did interact with anything, it took a very long time for them. Just before feeding time they would make their way toward the door. One time, one of them belted out a loud roar. They were very cute!